Before you commence your quest ! Your team will need to complete a *PMIon a current version of a popular quiz game in order to become familiar with the design's inherent strengths and weaknesses. *What is a PMI ? What does your team need to do ? Your team must demonstrate an understanding of the major issues affecting the world's polar environments. The issues to be explored have been organised into 5 categories related to the history, geography, fauna, people and preservation of the polar regions. A team will ideally consist of five members. Each team member will be responsible for researching one category. The five members will need to combine their knowledge and provide evidence of their understanding by presenting a powerpoint slideshow which addresses each of the ecological or ethical issues. How can you achieve this ? Your team will need to gather information at each stage of the quest . 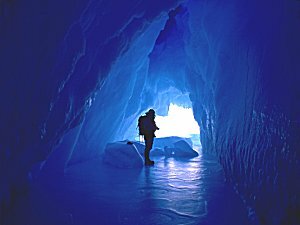 Your quest is to explore the polar environments, using the questions and online links as a guide. You will be able to seek help at any stage of the quest wherever you see a icon. A icon indicates a guiding hint to make your quest easier. Your team is required to record the research process before planning the final presentation. What is the big 6 ? View a powerpoint slide show which explains the big 6 in an interesting way. Always remember to click on the "back" button to find your way back from a website to this webquest ! How will your team's work be assessed ? informed answers to the "quest challenges"
How do I compile a bibliography ?